Introduce some native Iowan interest to your landscaping by planting a variety of flowering trees. 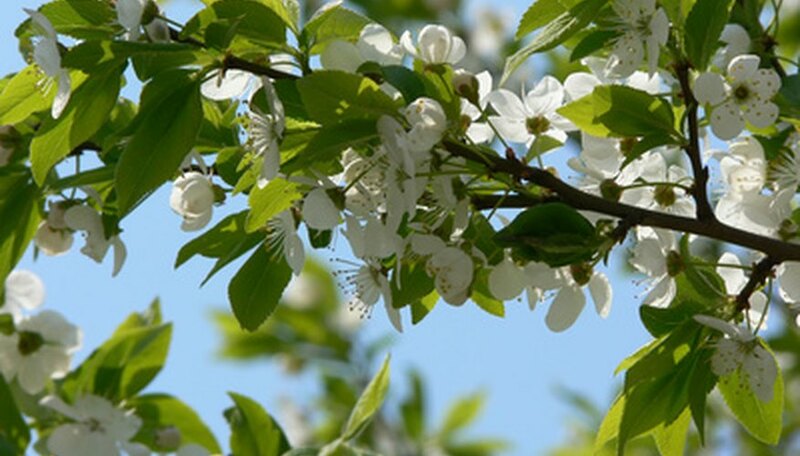 Blooming over a period of weeks in the spring, flowering trees often provide fragrance as well as color. Many attract hummingbirds or butterflies while blooming and produce edible fruit in the fall. Iowa's flowering trees range from shrub-sized to as tall as 100 feet. A tree that ranges in height from 15 to 100 feet, persimmon (Diospyros virginiana) has thick, nearly black bark that separates into blocks with age. Most trees grow between 35 and 60 feet. Persimmon's pale yellow flowers appear in May and June. The large, glossy, deep green leaves become yellow or--infrequently--reddish-purple in the autumn. Female trees produce single flowers, and male trees produce clusters of them. Both a male and female tree are necessary to produce fruit. Beginning in the summer, persimmons produce 1- to 2-inch astringent green fruits that become orange or purple after frost arrives in the fall. Exceptionally soft and sweet, the ripe fruit is edible right off the tree. It's widely used in puddings, breads, preserves, syrup, cake and ice cream. Uncollected persimmon fruit is a magnet for raccoons, opossums and other wildlife. Persimmon performs best in moist sandy soils and full sun to part shade. Plant persimmons where they are to remain. Their deep roots make transplanting difficult. Iowa crabapple (Malus ioensis), a member of the rose family, grows up to 35 feet. Its spreading branches create a dense, irregular canopy covered in the early spring with fragrant white or pale pink flower clusters. In autumn, the leaves become rich crimson. Iowa crabapple's fruit is a small, yellow-green berry appearing in early to mid fall. The tree's fruit is a food source for rabbits, squirrels, pheasants and other birds. Iowa crabapple does best in full sun and moist, well-drained loamy soil with a pH close to 7.0. Tolerant of dry, slightly alkaline soil, it becomes scraggly in shady locations. Trees are highly susceptible to cedar-apple rust and other leaf diseases. Removal of their root suckers will keep them from forming thickets. American plum (prunus Americana) is another small, thorny thicket-forming tree. Its heavy clusters of white or pale-pink spring flowers arrive in April. Growing up to 35 feet, this tree has a spreading canopy. Its glossy, deep red 1-inch fruit appears in late August or September. Autumn foliage displays range from pale yellow to brilliant scarlet.